Works as advertised. Arrived quickly Review by Amazon Customer "ralph-san"
Great price,great deal Review by Juinette J. On time and just what I needed! Review by Stuart S.
LOVED IT!! A+++!!!! Review by Jose Baquero "rkmar00n"
Works great Review by Vaughn "The answer man!" memory Review by Eric V.
Added new life Review by Hansen W. Meyer "HansMeyer"
Works as advertised Review by Bub Rub "woo woo"
very good memory Review by Terricita H.
Ram is not always Ram, but this is good Ram Review by Sound Guy "SG Owns one"
Works great Review by J-Rod "JR"
Komputerbay sent me a request to review their product. I DID purchase RAM a few weeks ago, so I didn't pay too much attention to the specifics. I then wrote a complimentary review. 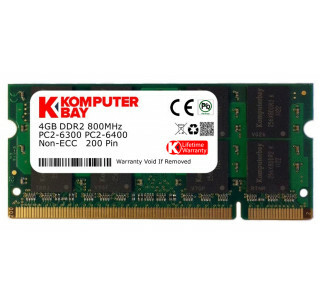 Horrible RAM, don't buy Review by Wilson Guzman "DJ Scooby Doo"
Komputerbay 4GB Kit (2GBx2) DDR2 800MHz (PC2-6400) CL6 SODIMM 200-Pin 1.8v Review by Kimbo, Cali "Kimbo"
Perking Up Old Dell Review by Peter Reque "Pete"
Nice memory for laptop Review by A. Luk "tungsquared"
Does the job Review by DEAN K.